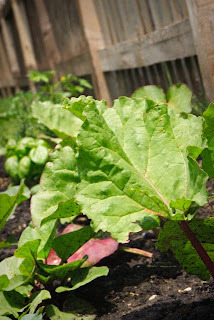 My little garden plot and the rhubarb leaves in it! Can't wait to eat some! Rhubarb pie is my favorite!! My mom just had me make one for her birthday. This rhubarb is originally from my great-grandmother's garden. It is older than I am at 49! I think of her when I fix it each summer!